Centre for Information Management | Knowledge Management Research Group Prepares to Collaborate with South Africa! Knowledge Management Research Group Prepares to Collaborate with South Africa! This is a particularly exciting (and busy!) week for me as I prepare to fly to South Africa to join the Library and information Studies Centre, University of Cape Town (UCT). The visit is a great opportunity to share experiences of knowledge management teaching, research and practice with academics and practitioners. In addition to working closely with Dr Connie Bitso from UCT, there will be collaboration between Loughborough University and institutes such as University of Pretoria and University of Western Cape. Moya Hoult, Manager of Charnwood Citizens Advice Bureau and lead on the Big Lottery funded project ‘Charnwood Connect’, will be joining me to showcase the project and to support the development of a community of practice with voluntary sector managers in Cape Town. A workshop on September 10th will be the main catalyst for developing these partnerships where the ‘joined up’ way of thinking about information and knowledge management in the Charnwood voluntary sector will be shared and feedback sought. The schedule of activities is very intense but it is hoped that this visit will open up all sorts of opportunities for KMRG members to link with South African counterparts and to develop more intermational KM projects. The visit and scheduled activities form part of LISC’s commemoration of its 75th birthday and is primarily funded by School of Business and Economics International Seedcorn monies. I feel very honoured to be included in these celebrations. 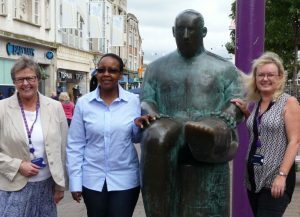 The picture below shows Moya, Connie and me in Loughborough yesterday when Connie literally made a ‘flying visit’ on her way to a conference in Leeds.